Nick and I celebrated eight years of marriage yesterday. Happy anniversary to us! Every time this date rolls around, I start to wax a little philosophical about the passage of time and the things we've experienced and accomplished and just how much I love this guy that I get to go through life with. This year is no different, especially compounded with the fact that Nick's youngest brother just got married in the same place as us, and only a few days before our anniversary. So many memories, and so much room for nostalgia! Indulge me a little in a list, will you? You know how much I love a good list. 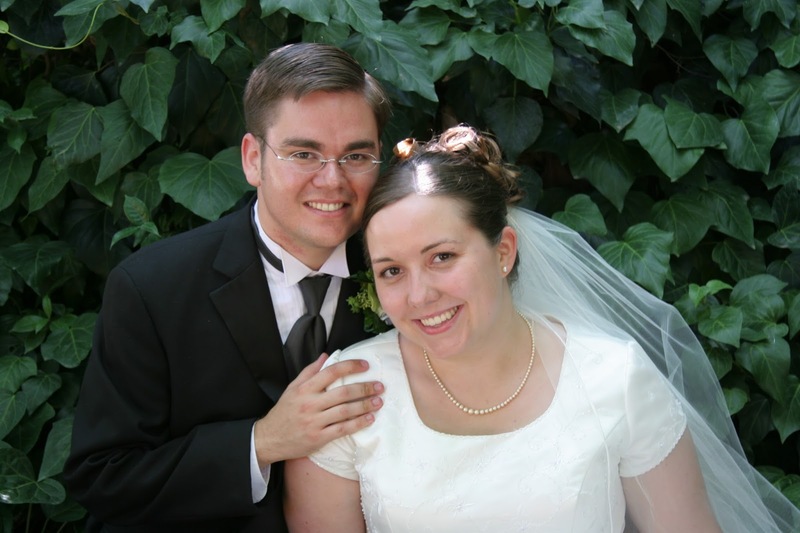 Eight things I have learned from eight years of marriage. The advice about putting each other's happiness first is solid, good advice. I mean, know that no one is responsible for your own happiness more than you are, and you need to live your own life and be your own rainbow and all of that good stuff, but at the end of the day, if two people are actively concerned with their partner's happiness before their own, that's going to take them a long, long way in a marriage. Wuthering Heights may be a misery from one end to the other (in my ever so humble opinion), but one thing Emily Brontë did get right was this: “He's more myself than I am. Whatever our souls are made of, his and mine are the same.” Nick and I are absolutely two separate people with different likes, dislikes and interests, but in the things that really matter, we are one and the same. Along those lines, we have not ever, not even once, argued about anything important, significant or worthwhile. Every fight we have ever had has been triggered by something completely trivial, and more often than not, turns out to be a misunderstanding. Maybe in another eight years we'll be able to remember that before a misunderstanding escalates into an argument? As tricky as it can be when life gets busy (and with kids, it does get busy), it is absolutely vital to make time for just the two of us. We celebrated our anniversary this year with dinner and a moonlit ride up a mountain on a ski lift (natch), and sitting close together, holding hands and just talking as beautiful, moonlit nature glided by was exactly what we needed in the midst of the crazy year we've been having. Make a little space, take a little time for just the two of you. Having kids is crazy. It changes everything. Yes, even that, whatever it is you're thinking of. Being a parent infiltrates every little nook and cranny of your entire being. And it is absolutely fantastic. Hands down the best decision we have made together, right after deciding to get married. It's also hands down the hardest thing we've ever done together, but when I consider having those two little people in our life, and how they make my heart swell with love, who cares how hard it can be? Listen, listen, listen. I'm still working on this. Listening is good. It shows your spouse that you love them, and that they are more important to you than Pinterest. I'm still working on this. Being married is great. We are constantly learning and growing and reaching and building and doing and loving all of this really great stuff together. And as much as I get to do all of this with the romantic leading man of my life, I also get to do it with my best friend. My best friend Nick, who likes to watch British TV with me, enjoys traveling to the same places as I do and shares the very same weakness for some fresh-baked cookies (or brownies or chocolate, we're not picky) in the evening that I have. We get shouty about the same political issues, and can talk for hours about how much we agree with each other. BFFs. I need Nick. When my days are hard, when something good happens, or the kids say or do something funny, I need to tell Nick about it. When I go to sleep at night, I need his body beside me. When my dad was dying, I needed Nick like I needed air. When he's beside me, I know I can do anything. He is my greatest love and my constant companion. Happy anniversary, loves! I'm so happy I have you. That was beautiful and I loved reading it. Lists are my favorite, too, and I love reading list posts!